The use of a type of yeast that will generally convert sugars to alcohol and CO2 at lower temperatures is called bottom fermentation. Bottom-fermenting yeast is sometimes referred to as lager yeast. Slower fermen­tations are associated with this yeast. The types of beer described below are bottom fermented. Lager. Lager was developed in Germany in about the seventh cen­tury. It was first introduced into the United States by the Germans in 1840. Lager comes from the German word lagern (to store), and is applied to bottom-fermented beer in particular because it must be stored at low temperatures for prolonged periods of time. Lagers were traditionally stored in cellars or caves for completion of fermentation. They are bright gold to yellow in color, with a light to medium body, and are usually well carbonated. Unless stated otherwise, virtually every beer matfe in the United States (more than 90 percent of them) is a lager. Lager is ideally served at 38° to 45°F. Bock beer. Bock beer is produced from grain that is considerably higher in extracts than the usual grains destined for use in lager beers. Bock, in German, means a male goat. Bock beer was originally produced around 1200 a.d. in the town of Einbeck, Germany. Today it is produced in virtually every country, in some form or another, on a seasonal basis, mostly during the winter so that it can be consumed in the early spring. Bock beers are usually quite dark in color with an intense, sharp, sweet aroma. They have a full-bodied flavor, followed by a slightly sweet, malty taste. A stronger version produced in very limited quantities in Germany is called Doppelbock. Bock beer is ideally served at 45° to 50°F. Dark beer. Dark beer is characterized by a very deep, dark color, a full-bodied flavor, and a creamy taste, with overtones of malt, bitterness, sweetness, and caramel. It is usually produced from the addition of roasted barley during the initial brewing stages. It should be served at approximately 45° to 50°F. Kulmbacher beer. This is beer that comes from Kulmbach, Germany. Some Kulmbacher beers are reported to have as much as 14 percent alcohol by weight, but those exported to the United States have far less. Kulmbacher beer is ideally served at 38° to 45°F. Light beer. Light beer is usually produced by the dilution of regular beers that have been brewed with the use of high-extract grains or barley and have been allowed to ferment dry. Another method of production involves the addition of enzymes, which reduce the number of calories and the beer's alcoholic content; its flavor is also considerably lighter. The purpose of producing light beer is to make a lower-calorie beer. A regular twelve-ounce beer has 135 to 170 calories; a light beer usually has under 100 calories. There are no current Bureau of Alcohol, Tobacco and Firearms rulings on minimum or maximum calorie levels. Light beers are ideally served at 38° to 45°F. Malt liquor. This is an American term for a lager beer with a con­siderably higher level of alcohol (usually above 5 percent) than most lager beers or ales. Tastes vary from brewery to brewery and brand to brand, with some even sweetened with fruit syrup. The name comes from the beer's malty flavor, which has overtones of bitterness. Its color is typi­cally darker than that of regular beers, and its taste is correspondingly heavier and fuller-bodied. Malt liquor is ideally served at 38° to 45°F. Munich (or Munchener). This type of beer was originally produced in Bavaria; it is now brewed in many parts of the world. It is slightly darker in color than Pilsner-type beers, although milder and less bitter than other German types. It also has a more pronounced malty aroma and taste, with a sweet finish and aftertaste. Munich beer is ideally served at 38° to 45°F. Pilsner (or pilsener). This is the most popular type or style of beer produced in the world. The word Pilsner is taken from the Czech town of Pilsen. Characteristically, these beers are a light golden color, with a highly pronounced hops (referred to as Bohemian) flavor and a delight­fully clean, crisp taste that refreshes and leaves the palate clean. Pilsner-style beers are usually dry to very dry in taste, although there are some slightly sweet pilsners produced. Pilsners are ideally served at 38° to 45°F. 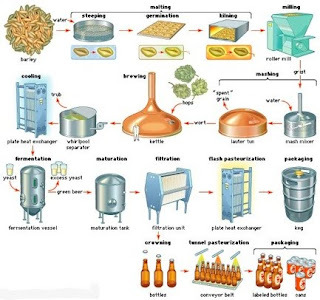 Top fermentation refers to the use of a type of yeast that generally will convert sugars to alcohol and CO2 at temperatures between 60° and 70°F, The beers described below are all top-fermented beers. Ale. Ale is a top-fermented beer with a slightly darker color than lager beer. It usually has more hops in its aroma and taste and is often lower in carbonation than lager-type beers. Ale is usually bitter to the taste, with a slight tanginess, although some ales can be sweet. Ales are usually fermented at warmer temperatures than lager-type beers (60° to 70°F) for from three to five days, and generally mature faster. Ales should ideally be served at 38° to 45°F. Cream ale. This is a blend of ale and lager beer. Cream ale is highly carbonated which results in a rich foam and strong effervescence. Cream ale is ideally served at 38° to 45°F. Porter. This is the predecessor of stout, and is characterized by its intense dark color and persistent bittersweet taste and aroma. It is lowei in alcohol than stout and should ideally be served at 55°F. It was inventec in 1729 by Ralph Harwood, a London brewer, who named it after tht porters who enjoyed drinking it. Stout. This beer obtains its dark (almost black) color from roastec barley, which has a very high extract level. It contains mostly this roastet barley, which is rendered sterile before germination, and a small amoun of malt for added flavor. It is quite thick and malty, with an intensi bitterness and underlying sweet taste. Stout is relatively low in carbon ation and should be served at 55°F. Weisse beer (or Weizenbier), This is the German name for a bet made predominantly from wheat. It is usually unfiltered and contain some yeast residue, and therefore is cloudy in appearance. Weisse bet is ideally served at 38° to 45°F. Brewhouse. An exact weight of ground malt is mixed with a predetermined amount of corn grits and brewing water in the cooker. The enzymatic action of the malt solubilizes the starches during a precise time/temperature cycle. The solubilized starch is then transferred to the mash tun, which contains the main mash. Another precisely controlled time/temperature cycle converts the starches to fermentable sugars. The clear liquid, called wort, is separated from the grain by straining in the lauter tun. The wort is transferred to kettles and boiled. Hops are added in exact amounts to provide the distinctive flavor of beer. At the end of the timed boil period, the hot wort is pumped to a tank to allow settling of unwanted protein. Fermentation. The wort is converted into beer during this stage. A small amount of brewer's yeast and a quantity of air are injected into the cooled wort as it enters the fermentation tanks. The yeast grows, producing enzymes that convert the sugar in the wort to alcohol and carbon dioxide gas (CO2). Some of the CO2 is collected and saved for later use. Fermentation takes about one week. When complete, the beer is filtered to remove yeast and other solids, then pumped to the aging tanks. Aging. "Green beer" is allowed to rest for an extended period in the aging tanks. When properly aged, the beer is filtered a final time; if the carbonation level is low, additional CO2 is added. Finished beer is then pumped to the packaging tanks. Water. Beer is approximately 90 percent water. Not all water is ideal for beer production, though it can usually be made so. Since water from any two areas is never exactly the same, breweries continually test samples from each plant location. The water is conditioned or treated when necessary to insure uniformity of product. Corn. The primary reason for adding corn grits to the brew is that Corn grits tend to produce the milder, lighter beer preferred by the American consumer. Like malt, corn is a source of starch that is converted to sugar in the brewing process. Hops. Hops are the dried, ripe blossoms of a perennial vine (Humulus lupulus) that are added to beer brews for flavoring. The characteristic bitter flavor of beer is attributable to the addition of hops or liquid hop extract. Hops also possess antiseptic properties that inhibit the growth of bacteria. This is particularly important in the brewing of the non-pasteurized draft beers. Brewer's yeast. This is the agent that transforms wort sugar into alcohol and carbon dioxide. It is actually a microscopic cell that multiplies rapidly. At the end of fermentation the yeast population has increased approximately fourfold. It is the enormous number of yeast cells that makes possible the rapid conversion of wort to beer. While all brewer's yeasts have the ability to ferment sugars to alcohol and carbon dioxide, they can differ considerably in their abilities and hence affect beer flavor in various ways. Beer is known to have existed 7,000 or more years ago. Pottery from Mesopotamia dating back to 4200 B.C. depicts fermentation scenes and shows kings sipping their version of beer through gold tubes. References to brewing have been found in hieroglyphics on the walls of ancient caves in Egypt. Archaeological discoveries show that beer was familiar not only to the Egyptians but also to the ancient Romans, Greeks, Assyrians, Babylonians, Incas, and Chinese. New York's Metropolitan Museum of Art has on display a wooden model of a c. 2000 B.C. brewery. In the twenty-third century B.C. in China, beer was known as Kiu. Even the Vikings made beer at sea in their war ships and drank it out of the horn of a cow. In the Middle Ages, brewing was done in the home by women who were known as "brewsters." In more modern times, Peter Minuit, after purchasing "New Amsterdam," established the first public brewery in 1622. William Penn, the famous American statesman, was probably the first to operate (in 1638) a brewery on a large commercial scale; it was located in Pennsbury,Bucks County, Pennsylvania. Other famous patriots who owned breweries were Samuel Adams, Generals Israel Putnam and Charles Sum-ner, Ethan Alien, and George Washington. President John Adams (1783-1789) even owned and managed his own tavern. Fraunces Tavern, the oldest tavern in America still in existence, was founded in 1762 by Samuel Fraunces, a black man. It is located at the corner of Pearl and Broad streets in Manhattan, where George Washington said farewell to his officers after a victory in 1783. This is a platform created for the students of HOTEL MANAGEMENT where they can access the notes of Food & Beverage Services. Also useful for the students who have missed out their classes because of some reason.